"Needless to say, I am a firm believer and advocate of your products. We ordered our first litho press from Takach Press Corporation in 1976. That press is still in excellent and trouble-free condition after almost 22 years of heavy student use and abuse." Our pressure system utilizes the finest quality hand machined parts, guaranteeing the printer the best mechanical advantage, ease of operation, and trouble free use. Features include 1" diameter hardened steel pins, custom machined connecting rods, piston and pressure cylinder, and permanently lubricated fiberglide bearings. The system will accommodate stones and plate backers ranging in thickness from .25" to 4.125". Three inch thick, staggered grain, hard rock maple wood is the core of our press bed. All wood sections are relief cut according to manufacturer's specifications to eliminate bed warp. Steel pins, 3/4" inch in diameter, connect bed sections. The top of the bed is covered with a neoprene rubber stone cushion. A galvanized steel cover is installed over the cushion which resists the chemicals used in the printing process and provides a durable working surface. Bed stops secure the moving press bed to the press frame. This feature is a must in today's safety conscious work environment. To eliminate uneven printing pressure and stone breakage, the bed is supported by independently adjustable precision ball bearings. This results in absolute parallelism between the bed and drive drum. Welded drum shaft, support baffles, and heavy wall drum stock are machined to precise specifications as a concentric unit. Maximum drum shaft support is achieved by two self-aligning ball bearing support units. All drums are nickel plated. Effortless hand cranking is made possible by our double reduction chain and sprocket drive system. Motorized drive systems are also available. Our Bed Latch System locks the press bed into the inking position. Leaning against or bumping the lock bar while inking will not cause the lock system to release. Hand operated models only. 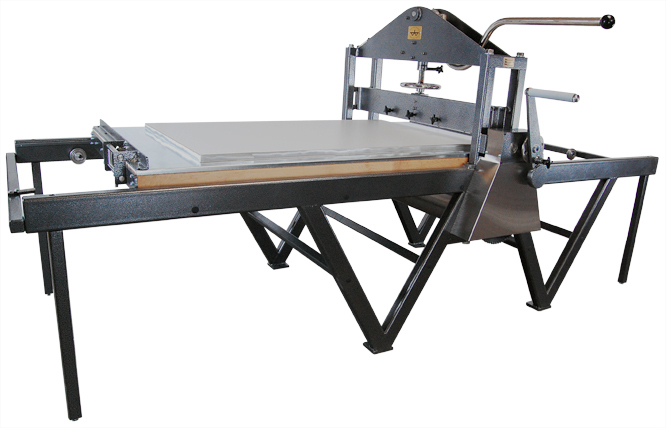 Secures the moving press bed to the press frame and allows full bed printability. A spring loaded clutch, mounted in the crank, allows the printer to disengage the clutch while the press bed is manually moved into or out of the inking position. This eliminates injury by a spinning crank handle. Hand operated models only. All press parts are protected by nickel plating, anodizing or high high durability powder coating. The powder coating is a custom metallic silver-vain. However, other colors are available for an additional charge. Custom Color Presses are available for an additional charge. 98" 122" 146" 170" 194"
46" 54" 60" 64" 68"
81.5" 97.5" 121.5" 133.5" 157.5"
Concentrate printing pressure through tympan and paper to the matrix. Provides a smooth glide surface between scraper bar and paper. Used to print Ball Grained Litho Plate. Grained limestone alternative with a crisp even tooth suitable for hand lithography. for accurate multi plate registration. Takach Press Hand Operated Levigator. Aid in transportation of Floor Model Presses.